Smart grid applications that not only interact with smart meters, but also with appliances, solar photovoltaic (PV) systems and electric vehicle (EV) charging stations, and can send price signals to consumers. That's one of several game-changing technologies slated for intensive test-bedding in 2014, industry players say. "This invasion of information technology into the power sector could unleash huge innovation in pricing plans for electricity consumers," Christophe Inglin, managing director of Singapore-based Phoenix Solar, said. "Look at how the telecoms sector has been transformed by the ability to offer per-second billing instead of flat rates. Imagine if we apply similar innovation to electricity markets, where spot prices can vary every half hour, and we can adjust pricing on the fly according to supply and demand dynamics," he said. "For instance, if demand rises too high, the spot price of electricity will increase rapidly, sending signals to consumers' Building Energy Management Systems to switch off non-critical loads such as washing machines, chillers or EV (electric vehicle) charging stations. Conversely, they can run washing machines late at night, and maximise their EV charging in pre-dawn hours to take advantage of low-price off-peak electricity," he explained. In return, consumers can get more favourable electricity tariffs. Demand response (DR) technology, which allows big consumers to reduce or shift their power usage during peak demand periods in exchange for payments, is also expected to gain traction in the coming year, Edwin Khew, chairman of the Sustainable Energy Association of Singapore said. Case in point, Diamond Energy is the first wholesaler licensed by the Energy Market Authority (EMA) to trade in demand response. The possibility of a DR scheme for Singapore's electricity market was first raised in October 2012 by S Iswaran, Minister in the Prime Minister's Office and Second Minister for Trade & Industry and for Home Affairs. DR allows a company to lower its energy costs, while alleviating systemic pressure on the grid at peak periods. This in turn helps to moderate price spikes, reduces energy costs and generates power savings. Consumers that are flexible in their electricity consumption can share these savings. As Singapore moves to become a hub for sustainable development projects and financing in Asia, it will be seeking out financial organisations along the likes of project finance firm Clifford Capital to base their related operations in Singapore, according to the Economic Development Board (EDB). Partially owned by Temasek Holdings, Clifford Capital was set up last year to plug funding gaps for large, long-term, cross-border projects, and it also represents a concrete step in Singapore's efforts to strengthen the cleantech industry ecosystem, Goh Chee Kiong, EDB's executive director of Cleantech, said. In the pipeline are initiatives including working with private companies to list their business trusts on the Singapore Exchange, stepping up usage of energy management systems in green buildings, and introducing an electricity demand response market, Mr Goh said. 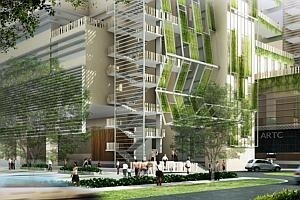 Green building technologies, especially those geared towards consumer-centric solutions, will become more mainstream in 2014, said Allen Ang, head of green building at City Developments Ltd (CDL). CDL invests between 2 and 5 per cent of its construction costs in green innovation, such as home energy monitoring systems which allow homeowners to remotely control their airconditioners. Since the formation of Singapore's first cleantech incubator in October, at least 10 companies (including a developer of solar microgrids that can power rural villages) have expressed interest. Several international trade commissions also want to see how the incubator can support companies that are keen to set up a base here and use it as a platform to venture into the region, Mr Khew said. The renewable energy market in South-east Asia is valued at about US$10 billion, he said. "Singapore represents a safe haven for their IP and also provides them R&D money to adapt their technology for tropical applications. Having an established test bed and a reference site in Singapore is a major calling card to any of the Asian markets and governments." Since 2006, Singapore has committed close to S$2 billion of public sector R&D funding in cleantech and sustainable development, with emphasis on energy, water and green buildings. For instance, Nanyang Environment & Water Research Institute, one of the world's largest water and environmental R&D centres, opened in CleanTech Park this year and will receive S$132 million in funding over the next four years. Mr Goh said that many of these companies also take advantage of Singapore's innovation capability, strong talent base and regional connectivity with markets in Asia. In recent years, Singapore has seen a number of cleantech startups formed, including Sunseap (solar leasing), Green Koncepts (cloud-based building energy management), and Greenlots (EV charging solutions). As Singapore moves to incorporate solar energy into the power grid, the EMA is raising the current cap on intermittent generation sources from 350 MW now to 600 MW (representing 10 per cent of current peak electricity demand here). Energy storage will also be an increasing trend, Mr Khew said. "We need to know how to store such energy, especially for renewable energies like solar, when additional energy is produced, instead of it going into the grid at a lower off-peak cost, it can be stored for use during high peak prices." While solar energy has become much more cost-competitive today, industry players say that the impact of intermittency on the national grid at high penetration levels still needs to be addressed. "A PV system's electricity production fluctuates according to sunshine. If a cloud crosses the sun, output can drop quite sharply, and then jump up again once the cloud has passed. The cost of compensating for intermittency is spinning reserve, or backup generators on standby. More elegant technology solutions include smart grid technology, demand response and even battery storage," Mr Inglin said. Solar prices, which were driven down in the past two years by raw material cost cuts arising from massive capacity expansion in China, are expected to continue their downtrend over the next two to three years, KPMG Singapore partner Sharad Somani, said. He sees solar prices declining further due to a reduction in overhead, installation, financing, permitting and interconnection costs. Those costs may not often be high in terms of dollar per watt, but are often costly in terms of slowing down PV deployment, he said. Another regulatory change affecting the green tech sector is EMA's move to lower the contestability threshold from the current 10,000 kWh to 8,000 kWh on April 1, 2014, and then to 4,000 kWh on Oct 1, 2014. That will allow contestable consumers, in particular landed property owners with rooftop PV systems, to be eligible for the option to buy electricity at market rates from a licensed retailer of their choice, Mr Inglin said. More importantly, it will enable contestable consumers to get reimbursed for any excess electricity they feed into the grid, he said. Previously, only non-contestable (residential and small commercial) customers get reimbursed for exported energy. SP Services installs a special dual register meter to keep track of imports and exports; and offsets exports against imports on the monthly bill. Up until now, it has proved impossible for contestable customers to enjoy the same benefit. Batteries are still far too expensive to justify storing excess production, he said. On the electric vehicle front, while the introduction of new EVs from BMW among others is revving up excitement, the lack of adequate electric charging infrastructure and the vehicle's high upfront costs are key challenges, said Subodh Mhaisalkar, executive director of NTU's Energy Research Institute. "We see test-bedding an autonomous electric shuttle for last-mile transportation, a super capacitor-based bus, and also a lithium ion-based bus on NTU's campus. New technologies such as wireless charging embedded in the pavements at bus stops will also be tested. The main challenge we anticipate is that the initial market size will be relatively small and may prevent large-scale interest from businesses to invest," he said.